Our flagship London showroom in Notting Hill, is a lovely, characterful building with a succession of airy spaces leading one from another. It’s the perfect backdrop for our bespoke kitchens. I designed each set around the architectural features of the available space, just as we do in our client’s houses, and this allowed me to show how diverse our designs are. Our heritage is classic English furniture, which has the ideal proportions for British houses. The style is perfect for period buildings, but, equally, with a few tweaks, can be very modern if the setting demands. I also had to take into account the views through from one room setting to another and maintain a feeling of a journey. We want to lead visitors through the whole showroom via a succession of different ‘kitchen experiences’. Q: Are there any particular problems when designing a showroom, or is it easier than a ‘real’ kitchen? It’s harder in many ways. When I’m working for a client, there’s always at least two people involved, myself and the client, and a lot of exciting design comes out of an ongoing dialogue between us. And, in the end, the clients’ wishes are always paramount, which settles any unresolved questions! When I’m designing a showroom installation, I have to be both client and designer at the same time. To overcome this, I always start from a strong understanding of how the finished room will look and feel. Of course, because it is a showroom, I’ll have very clear objectives in terms of which specific features need to be incorporated. Everyone who stands in this kitchen immediately remarks on how calm it feels. That feeling comes from the colour schemes, and is very much a feature of our English kitchen. We’ve combined both fitted and freestanding pieces to create an ordered, yet very welcoming, space. The English classic aesthetic lends itself so well to designing highly-functional kitchens. 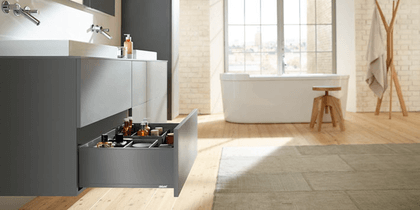 One of the elements which shows this best is the imposing freestanding dresser with bi-fold doors concealing a sink, microwave and coffee machine. The cabinetry is hand painted in Martin Moore’s own paint in cream and pale grey, whilst the Caesarstone worktops reflect this neutral scheme, with ‘Ginger’ against the wall and ‘Dreamy Marfil’ on the island. Q: Were the roof lights already in position, and did the kitchen layout work around them? When we took over the showroom, it had been a fashion store, with all the interiors painted black and natural daylight largely excluded. We had absolutely no idea that these roof lights were there because they had been boarded up and then plastered over! The day our builders found them was a brilliant surprise and I did then plan my design to make the best use of them within this kitchen setting. Again, this is something we do all the time in clients’ homes – designing a bespoke response to showcase the fabric of the building. For me, there are several layers of pleasure in this kitchen. Firstly, it’s so elegant, the symmetry and balance of the space makes it all work beautifully. I also love the fact that each and every piece of furniture in it started from a blank sheet of paper. I designed it, drew it up and then it was built in our Yorkshire workshops before being transported to London, fitted and hand finished in situ. It’s real furniture. And finally, I love the fact that such a highly functional, highly equipped kitchen can be designed so seamlessly and comfortably without compromising the concept of real furniture. Start the process as early as possible and seek expert advice. Whether you are shopping for a high end bespoke kitchen or making the most of a small budget, ask what sort of guarantee is offered and how long the business has been going. Talk to friends and relatives about their experiences and get their recommendations. Above all, you should feel that you have a rapport with the company and that they offer a high level of service. If not, move on. Make a list of must-have appliances. For design inspiration, search magazines and online resources to pull together a ‘mood board’ capturing the look you want to achieve. All design and bespoke cabinetry by Martin Moore, 0845 180 0015, www.martinmoore.com; kitchens are from £35,000. This showroom is at 176 Westbourne Grove, London W11 2RW, 020 7221 2727.